The NEC D4 modular storage array offers both Fibre Channel and iSCSI connectivity in the same array. 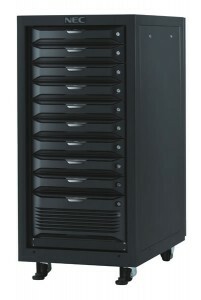 Offering many built-in features, as well as, support for NEC’s enterprise-class storage software. The D4 array is scalable from just 300 GB to 288 TB capacity via up to eleven 2U 12-drive expansion enclosures. Aggregate throughput of over 1,200 MB/s to hosts is provided via up to eight 8 Gbps Fibre Channel ports, or up to four 10 Gbps iSCSI ports. The ports can be connected into a SAN, or direct-connected as a simple and low-cost DAS solution. The disk enclosures are connected to the controller through a SAS wide-link connection for a full 48 Gbps bandwidth to each disk enclosure.